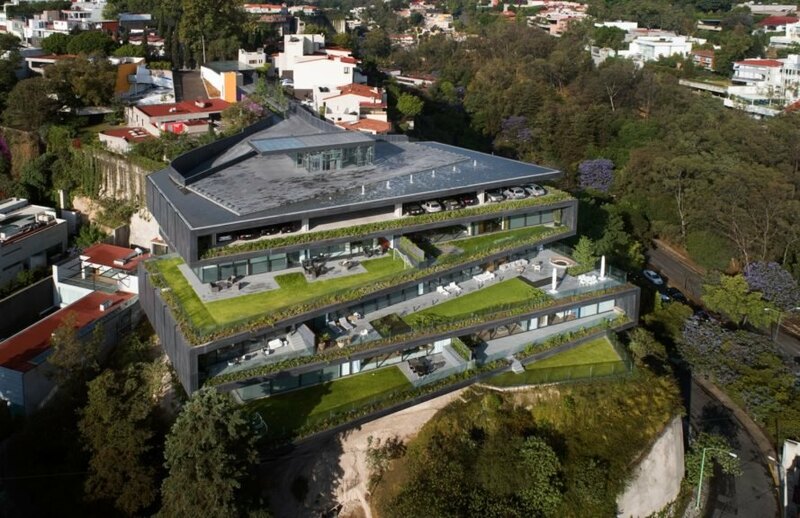 A challenging hillside site in Mexico City has given rise to Alcázar de Toledo, a luxury residential development designed by Sordo Madaleno Arquitectos to look like an extension of its lush landscape. 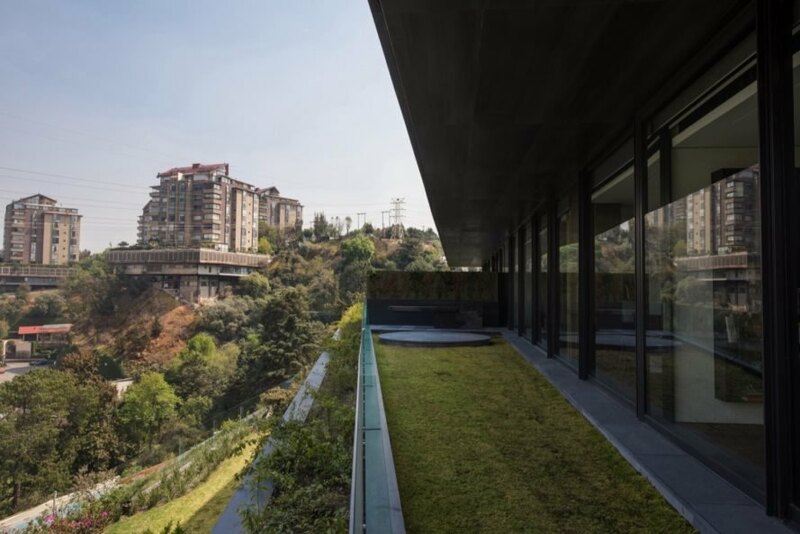 Embedded into the rugged terrain, the five-unit apartment block is made up of a series of green terraces that zigzag up the slope and provide deep roof overhangs to the bands of glass that wrap around the residences. In addition to its striking and sculptural form, the 5,471-square-meter building also affords spectacular panoramic views of the city. Completed in 2018, Alcázar de Toledo consists of four levels. 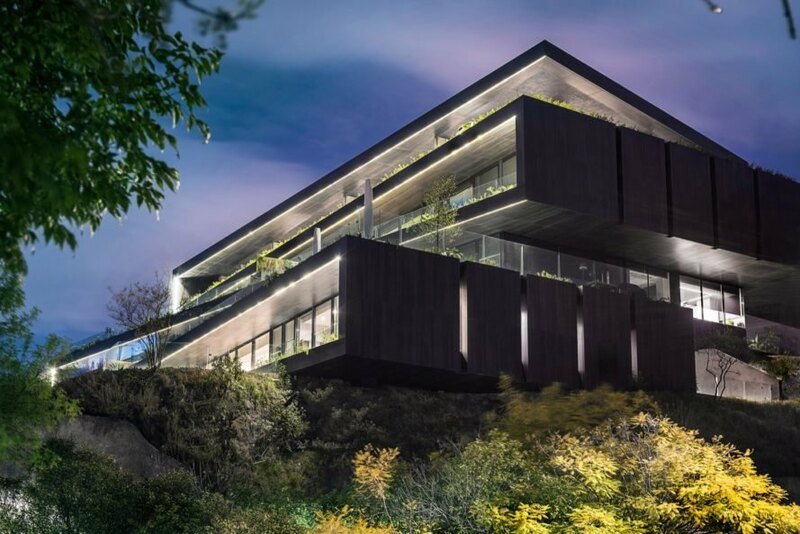 The parking spaces are located on the topmost floor that descends via ramp down 5 meters to the reception and lobby with views of a large wooded area as well a water focal point with fountains. The five apartment units are spread out across the remaining floors, with two 500-square-meter properties on the level below parking; a 700-square-meter unit on the floor below; and two more 500-square-meter apartments placed on the lowest level. The different sizes of each unit translate to different programming and range from two to four bedrooms. A pool, spa, gym, terrace, dressing rooms and bathrooms are located on the second level from the bottom. 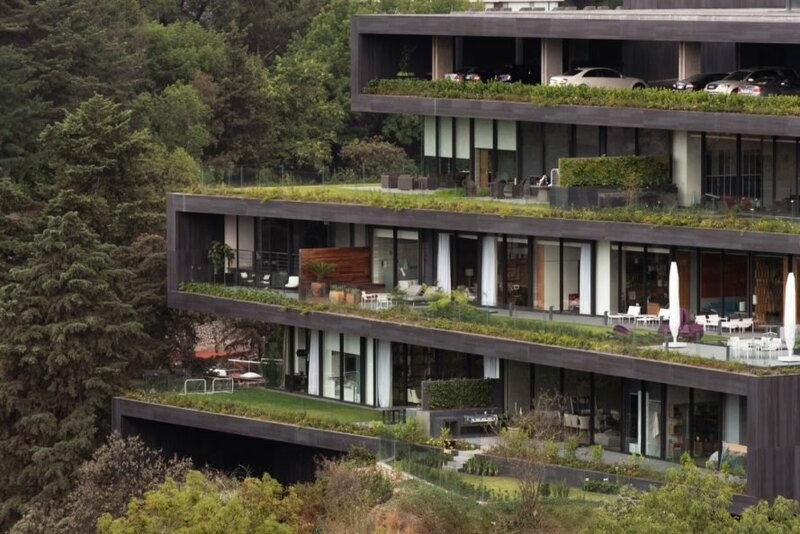 Natural light and ventilation are maximized through the interiors, which all feature tall ceilings, open-plan common areas and full-height glazing shaded by the overhanging green roofs. Rainwater is also harvested, treated and reused on site for irrigation. The rainwater cistern is located beneath the building. 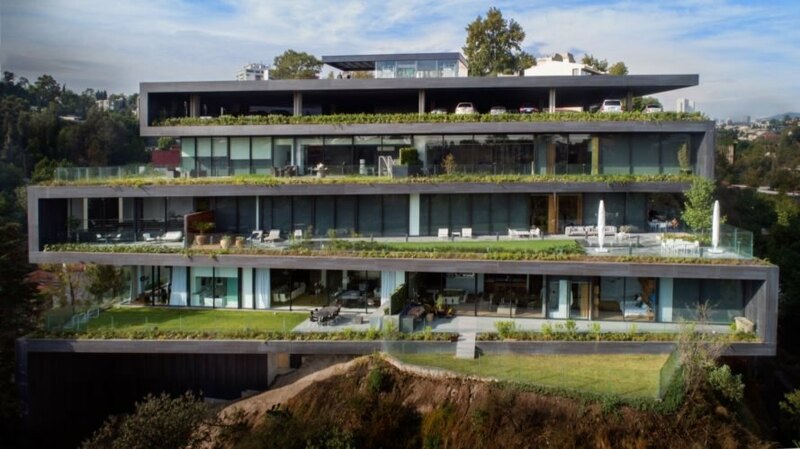 These luxury residences benefit from landscaped terraces. The architects built Alcázar de Toledo into a challenging hillside. An aerial view of the residences. Each floor is situated for different programming. Parking spaces are on the top floor. Each floor features landscaped terraces with city views. The apartment building houses five luxury units. The building is also home to a pool, spa and gym. In addition to plentiful green roofs, the complex also embraces native plantings and harvests and reuses rainwater.